The 4th edition of this publication provides recommended minimum performance and mechanical specifications for the design and qualification testing of aviation fuel hydrant system pit valves and associated couplers. It also specifies requirements that need to be met to achieve universal interchangeability between components of various manufacturers and requirements for optional features which component manufacturers may be requested by users to provide. Providing greater emphasis on the need for universal interchangeability between hydrant pit valve and hydrant pit coupler combinations between any manufacturer. Including the requirement for the hydrant pit valve manufacturer to provide detailed instructions for the mounting of the valve to hydrant riser flanges. Specifying the maximum permissible wear measured across any point on the diameter of the hydrant pit valve adapter ring and the distance from the top seal face of the adapter ring to the underside of the 45° angled face that a pit valve wear gauge shall be able to assess. An expansion of the requirements for production quality assurance, inspection and acceptance and shipment. 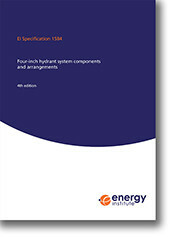 The qualification testing requirements that were included in the 3rd edition of this publication have not been significantly amended in this 4th edition. Therefore, existing qualifications to the 3rd edition are recognised as also meeting the requirements of this 4th edition.